Product prices and availability are accurate as of 2019-04-24 01:34:27 EDT and are subject to change. Any price and availability information displayed on http://www.amazon.com/ at the time of purchase will apply to the purchase of this product. The G5 Contour is a non-invasive massage machine for skin, scalp, muscles, lymph nodes and the circulatory system. 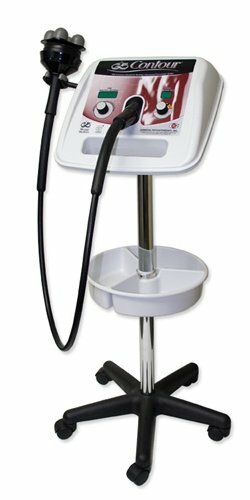 Extraordinary results are achieved with our famous G5 Directional-Stroking action, which combines vertical and parallel forces to produce effective and comfortable percussion, gyratory massage, deep tissue mobilization, kneading and compression, skin layer resonation, and other aesthetic therapy techniques, such as cellulite reduction. Comes complete with caster stand, accessory tray, and Spa Treatment applicator package. Continuously-variable speed: 10-60 CPS; plus timer.